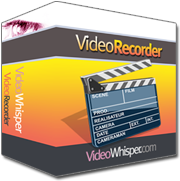 The VideoWhisper Video Recorder component can easily be used to add webcam recorded videos and archived streams to Joomla sites. Register an account to test video recording and use left menus to record and browse videos. The administrators can access the component options page from Admin Panel > Components > VideoWhisper Video Recordings. That page shows integrated component detection and allows changing component's settings from Parameters button. Administrators can also change player and enable integrations (exporting videos to other components). Users can record webcam videos on the website or import their own archived streams. Administrators can import any available archived streams. Users can view the list of video recordings filtered by date, title or number of views. Can search, filter by tag/author. Video details can be changed by the owner or by the administrator. The owner and the admin can also delete videos. Recorded and imported videos are automatically included in supported components if integration is enabled and these are available: JomSocial, HWD Video Share, ALL Video Share. Before installing, make sure your hosting environment meets all videowhisper application requirements. - For conversions and multiple integrations, rtmp server must be on same physical server as web server so scripts can access the recordings. We recommend Wowza hosting. - For conversions web hosting requires ffmpeg (with h264, faac, speex codecs) to generate mp4 for iphone/ipad and ffmpeg2theora for ogv needed for HTML5 playback in certain browsers. Install the component zip from Extensions > Install/Uninstall in joomla administrator interface. From joomla administrator interface fill in component parameters from Components > VideoWhisper Video Recordings. We send you these settings if you host with us. Disable/configure any SEO/ad injection components to avoid altering output and urls for these components. Changing links or adding extra content to component output will usually cause flash application parameter errors.